Enjoy LA for tthree whole days. Recommended for riders that want to see more of LA or spend a day at Universal Studios (admission sold separately). With the largest open-top Hop-on Hop-off City Sightseeing bus service in the world, discover the many marvels of Los Angeles attractions on the ultimate customized tour in comfort and style! First departure from Stop #1 Dolby Theater: 9:00 am. Last full loop departs from Stop #1 Dolby Theater: 7:00 pm. First departure from Stop #7 Beverly Hills: 10:00am. Last full loop departing from Stop #7 Beverly Hills: 5:30pm. Last returning bus from Stop #57 Santa Monica Pier to stop #7 Beverly Hills: 6:10pm. Last departure one way from Stop #7 to stop #57 Santa Monica Pier is at 7:40pm. First departure from Stop #1 Dolby Theatre: 9:00am. Last full loop from Stop #1 Dolby Theatre is at 5:30pm, returning to Hollywood at 6:30pm. Last departure from Stop #1 to Dolby to Universal and hotels: 6:30pm. Bus terminates at Universal Studios. 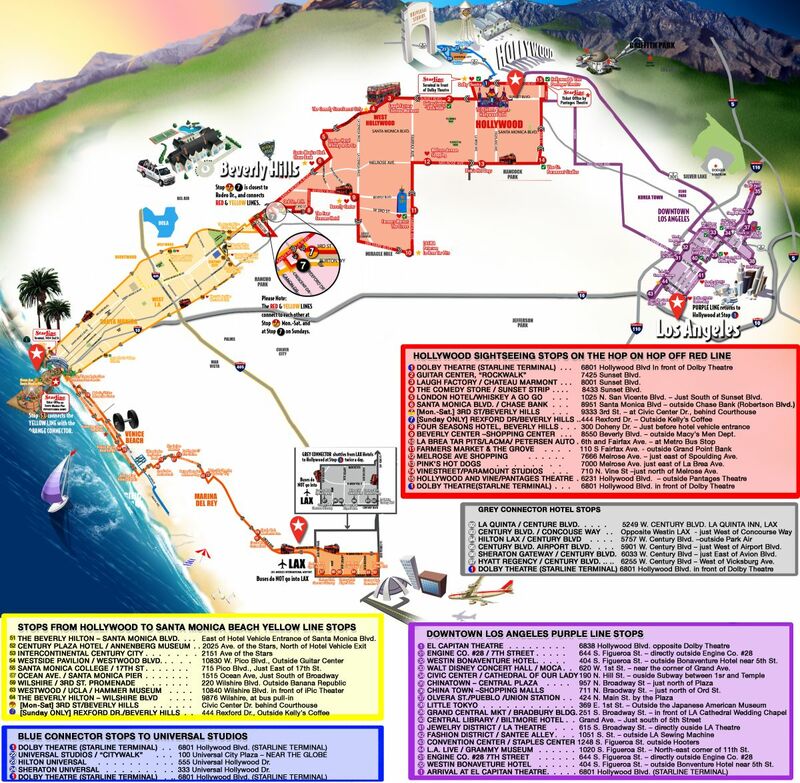 First departures from Stop #92 La Quinta: 8:00 am & 8:30am from hotels near LAX on Century Blvd. Starting at Stop #92 La Quinta. Last departing Stop #1 Dolby Theatre returning to hotels near LAX: 7:00 pm. Note: Buses do not go into LAX airport. First departure from LAX area hotels starts at Stop #92 La Quinta: 8:00am & 8:30am, arriving at Santa Monica Pier Stop #57: 9:30am and 10am. Departing from Stop #57 Santa Monica Pier (Ocean and Broadway) at 7:00pm. Returning to hotels on Century Blvd near LAX and Marina Del Rey hotels. Buses do not go to LAX airport. Starline Tours' Hop-On Hop-Off Los Angeles buses showcase the very best the city has to offer, from the historic and revitalized downtown core to the stunning coastal landscapes and legendary beaches of Santa Monica. We offer 24-hour, 48-hour and 72-hour passes, giving you the freedom and flexibility to see the city on your own schedule while enjoying the comfort and convenience of our open-air double-decker bus service. Our Hop-On Hop-Off Los Angeles sightseeing bus service is easy and fun to use. After purchasing your pass, simply board the bus at any of our 70 stops and enjoy the ride until you reach a part of the city you would like to see in more detail. Then, you’re free to disembark and explore at your leisure before re-boarding and continuing the tour. Our brochure provides a detailed timetable and bus schedule, helping you plan your day with ease and accuracy. While you’re on board, you’ll learn about the many marvels of Los Angeles with the help of our pre-recorded tour narration. Service is offered in a total of nine languages, including English, Spanish, Portuguese, Chinese, Japanese, Korean, German, French and Italian. With a total six of routes, our Hop-On Hop-Off Los Angeles bus tours deliver an unforgettable sightseeing experience. To see a live bus map and arrival times, visit starlinegps.com. Starting Oct 3, 2017 Hop On Hop Off buses will begin winter schedule with buses terminating 1 hour early. For example, the last bus to departure stop #1 is 6:00pm follow by the last bus to departure stop #7 (yellow route) is at 4:30pm. Note: The LAX shuttle will remain the same departing at 6:30pm and 7:00pm from stop #1 and Purple route will also remain the same.